Our Red, White & Blue, American Pride Personalized Sweatshirts display your love for the USA. Show off your American pride with one of these Patriotic Customizable Sweathirts. Great personalized gifts for the 4th of July, Memorial Day & Veteran's Day. Your Personalized USA Pride Shirt is available on our premium white cotton/poly blend Sweatshirt, machine washable in adult sizes S-3XL. Also available in Ash Gray. Our Personalized Gifts are personalized free. 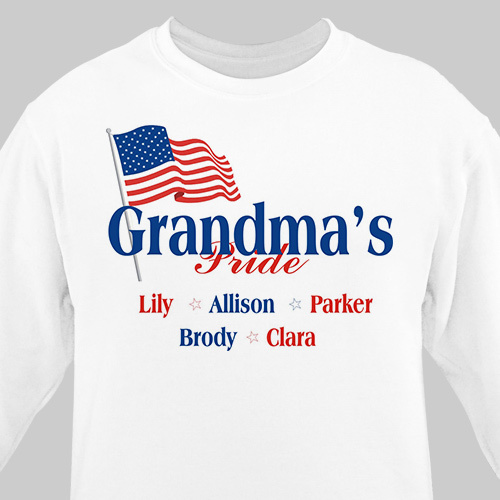 Personalized American Pride Sweatshirts can be customized with any title and up to 30 children or grandchildren’s names. Well made and eye catching product. My husband loves it. GiftsForYouNow.com has many Personalized Military Gifts for your favorite Soldiers. Select any of our Personalized Welcome Home Gifts today and we will personalize it for FREE. GiftsForYouNow.com also has a wide array of Personalized Patriotic Gifts for the 4th of July, Memorial Day and Veteran's Day.